The Model 25HP PLUS is an advanced ultrasonic gage that makes thickness, material velocity, and time of flight measurements on materials such as composites, fiberglass, plastic, rubber, and cast metals that are difficult or impossible to measure using standard ultrasonic gages. Measuring sound velocity with this gage allows monitoring of changes in material properties such as the degree of nodularity in cast metals. 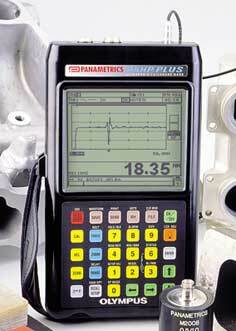 The 25HP PLUS features a large LCD that displays both the selected type of measurement in bold numerals and the live ultrasound waveform. This unique gage features a host of standard measurement features and a sophisticated alphanumeric file-based datalogger. Mode 1: Time interval between excitation pulse and first backwall echo, using contact transducers. Mode 3: Time interval between successive backwall echoes following the first interface echo after the excitation pulse, using delay line and immersion transducers. Min/Max Mode: Displays current thickness, minimum thickness, or maximum thickness depending on setting. Freeze Mode: Freeze and Un-Freeze live A-scan with thickness. Waveform Display Range and Delay Control: The horizontal span of the waveform is set at selected intervals with a fully adjustable delay. Differential Mode: Displays thickness difference between actual measurement and preset reference value. Application Auto-Recall: Automatically adjusts internal parameters and zero offset for a wide variety of transducers. Stored Standard Setups: 25 stored transducer setups allow fast, easy calibration for Panametrics-NDT standard transducers. Stored Custom Setups: Up to 35 stored custom transducer setups for best performance in special applications. Backlight: Electroluminescent backlit display, with power save feature. Multi-Language Display: Keypad selectable display languages. Included are English, French, German, and Spanish. Datalogger and RS-232: The 25HP PLUS identifies, stores, recalls, clears, and transmits thickness readings, waveform images, and gage setup information via the RS-232 Serial Port. Baud Rate, Word Length, Stop Bits, and Parity are adjustable from the keypad. Location Codes: 8-character file name plus 16-character alphanumeric location code input. Multiple Comments per location. File Structures: Data can be stored in 7 standard or custom application-specific file structures. 2214E 5-Step Test Block, 1018 steel, English Units: .100", .200", .300", .400", .500"
2213E 5-Step Test Block, Aluminum, English Units: .100", .200", .300", .400", .500"